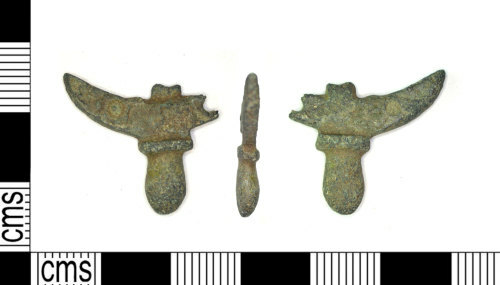 Medieval copper alloy strap end fragment, 21mm in length, 17mm wide and 2mm thick with a weight of 2.93grams. The fragment is part of the central frame of a three part strap end. The object consists of the lower central part and has a crescentric shaped and rectangular cross sectioned incomplete plate. In teh centre of its outer rounded edge it has an 'acorn' shaped terminal which has a D shaped cross section and has a rounded collar where it joins the plate. On the opposite side of the plate is a corresponding small rectangular shaped and cross sectioned projection.